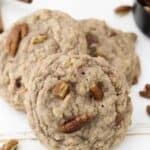 These homemade oatmeal Cinnamon Pecan Cookies are soft and chewy and loaded with cinnamon spice and chopped pecans for a buttery finish. Preheat the oven to 350° F. Line a baking sheet with parchment paper or a silicone baking sheet. In a separate bowl, combine the flour, oats, cinnamon, salt and baking soda. Stir to combine and slowly add the dry ingredients into the dough, mixing on low speed until dough starts to form. Before the dough thickens, add the chopped pecans. Beat a couple of times until they start to incorporate. Use a large cookie scoop and place on a sheet pan about 2 inches apart. Bake for 11-13 minutes. The center of the cookie should be slightly under baked but not too gooey. Allow to cool on the baking sheet for 5-10 minutes before transferring to a wire rack to cool.